Download the CSPAAA Museum and Educational Center Building Committee Constitution & By-laws in pdf format. There is hereby constituted, on the 2nd day of January, 2004, at 294 Colony Street, in Meriden, Connecticut, an organization to be known as The Connecticut State Police Academy Alumni Association Museum and Educational Center Building Committee. This organization is a sub-organization of The Connecticut State Police Academy Alumni Association, Inc., (CSPAAA) and will report directly to the President, Officers, and the Board of Directors, of the CSPAAA. II.A - The purposes and objectives of this organization are to support, coordinate, organize, and work, towards the goal of the organization’s principal organization, The Connecticut State Police Academy Alumni Association, of the creation of The Connecticut State Police Museum and Educational Center. This organization, under the direction of the President of the CSPAAA, will participate in, but not be limited to, the raising of funds to plan and build a museum and learning center that will display the history of the Connecticut State Police Department and additional history on law enforcement within Connecticut. 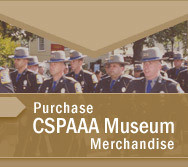 Funds for this museum project will be raised in a variety of ways, including, but not limited to, sales of CSP and CSPAAA memorabilia, from private and corporate charitable donations, memorial donations from past and present members of the CSPAAA and the Connecticut State Police Department, and from other sources. The members of the Board of Directors, and the Officers of this organization, the Officers and members of the Board of Directors of the CSPAAA, may accept such donations towards the construction of this museum and learning center. II.B – This organization is organized exclusively for the purpose of raising funds, as well as planning, and organizing, the construction of The Connecticut State Police Museum and Educational Center. This organization is also created to operate, maintain, staff, and fund, The Connecticut State Police Museum and Educational Center after it is built. It is also organized exclusively for charitable and educational purposes within the meaning of section 501 (C)(3) of the Internal Revenue Code 1986. No Director, Officer, member of the Board of Directors, or any member of any committee, may receive compensation for any services rendered to this organization in any capacity. No assets, or any part of any fundraising monies, shall be given, in any manner, that benefits any Director, Officer, member of the Board of Directors, or any member of any committee. No substantial part of the organization’s activities shall include campaigning, or propaganda, or otherwise benefit, any political campaign, of any campaign, for any candidate of any political office, or one who seeks such office. This includes the publishing, or distribution, of any political statements or campaign material. II.C – Notwithstanding any other provision of this document, the organization shall not carry on any other activities not permitted to be carried on (a) by an organization exempt from federal income tax under section 501(c)(3) of the Internal Revenue Code, or corresponding section of any future federal tax code, or (b) by an organization, contributions to which are deductible under section 170(c)(2) of the Internal Revenue Code, or corresponding section of any future federal tax code. II.D – Upon the dissolution of the organization, assets shall be distributed for one or more exempt purposes within the meaning of section 501(c)(3) of the Internal Revenue Code, or corresponding section of any future federal tax code, or shall be distributed to the federal government, or to a state or local government, for a public purpose. Any such assets not disposed of shall be disposed of by the Court of Common Pleas of the county in which the principal office of the organization is then located, exclusively for such purposes or to such organization or organizations, as said Court shall determine, which are organized and operated exclusively for such purposes. III.A – The Officers, and members of the Board of Directors, shall have, under the direction of the President of the Connecticut State Police Academy Alumni Association, Inc., the authority and privilege to raise funds for the planning, designing and construction of the Connecticut State Police Museum and Educational Center. This authority also includes, upon the construction of this museum, the same authority and privilege, to continue raising funding for the maintenance and care of this museum. This authority also includes, upon the completion of the construction of this museum, as approved by the President of the CSPAAA, the authority to hire, and pay, staff members to run the daily operation of the CSP Museum and Educational Center, if deemed so necessary. III.B – The Officers, and members of the Board of Directors, shall meet no less than four times each year. The Officers, and members of the Board of Directors, shall each serve one-year terms, starting on the date of their election and terminating when their successors have been so elected. This election shall be held every May, at a date, time and place, to be announced by the President of the CSPAAA. Nominations for Officers, and the Board of Directors, shall be announced at the April Social Meeting of the CSPAAA, by the Nominating Committee Chairperson, whom is appointed each year by the President of the CSPAAA. Nominations for any position within this organization may also be made from the floor at the May Meeting of the CSPAAA. Voting will take place at the May Meeting of the CSPAAA by way of a separate election from that of the CSPAAA. Officers, and members of the Board of Directors, may succeed themselves in the same position. The Immediate Past President of the CSPAAA, as long as the Past President has not been out of office as President of the CSPAAA for more than two years, at the start of his/her term, shall be a member of the Board of Directors. The CSPAAA Nominating Committee will have the responsibility of conducting each yearly election. III.C – The Officers of this organization shall include a Chairperson, a Vice-Chairperson, a second Vice-Chairperson, a Secretary, the Immediate Past President of the CSPAAA, and a Treasurer. The Board of Directors shall be made up of at least five members and no more than seven members. One position, on the Board of Directors, will be a Standing Position for the President of the Connecticut State Police Academy Alumni Educational Foundation that is in office each year. Members of the CSPAAA Board of Directors, the Officers of the CSPAAA, as well as members of the CSPAAEF Board of Directors, and the Officers of the CSPAAEF, may be Officers, or members of the Board of Directors of this organization, while serving similar terms of their offices within the CSPAAA and the CSPAAEF. Officers, and/or members of the Board of Directors, of this organization must be, or have been, sworn members of the Connecticut State Police Department, who are active good standing members of the CSPAAA. The Officers, and the members of the Board of Directors, may, with the approval of the President of the CSPAAA, appoint Honorary Members to the organization’s Board of Directors. These Honorary Members shall have no voting privileges, or standing on any committees. Honorary Members appointed to the Board of Directors must first be accepted as dues paying Honorary Members of the CSPAAA. III.D – The Chairperson of this organization shall be responsible for presiding over all meetings of the Officers and members of the Board of Directors. In the absence of the Chairperson, the President of the CSPAAA shall be responsible for presiding over organizational meetings. In the absence of the Chairperson and the CSPAAA President, the Vice-Chairperson, and then the second Vice-Chairperson, may preside over meetings of the organization and have the powers of the Chairperson for that meeting. A quorum of Officers and members of the Board of Directors must be present for official business to be conducted at any organizational meeting. III.E – The Chairperson shall have the authority to fill vacancies that occur during the term of office held by an Officer and/or member of the Board of Directors in any given year. That position shall be filled only for the term of that current year. The Chairperson shall have the authority, as approved by the CSPAAA President, to direct and coordinate all fundraising efforts of this organization. The Chairperson, acting in conjunction with the President of the CSPAAA, and the Officers, and the members of this organization, shall have the authority to create any and all Standing Committees needed to accomplish the goals and objectives of this organization. All Standing Committees shall be approved by a majority of the vote of the Officers and members of the Board of Directors of this organization. Each Standing Committee shall have a Chairperson so appointed by the Chairperson of this organization. The Chairperson of The CSPAAA Museum and Educational Center Building Committee, at a minimum, at each and every Spring and Fall CSPAAA Social, shall submit a complete report to the President of the CSPAAA, on the activities, and progress, made by this organization towards the construction of the CSP Museum and Educational Center. The Chairperson shall have the authority, with the consent of the majority vote of the other Officers and members of the Board of Directors, to make charitable donations to Law Enforcement Not-for-Profit events and organizations. The President of the CSPAAA, the CSPAAA Officers, and the members of the CSPAAA Board of Directors, shall have complete and final decision making responsibilities on the expenditures directly related to all architectural and construction fees regarding the CSPAAA Museum and Educational Center. The President, the CSPAAA Officers, and the members of the CSPAAA Board of Directors, shall have final and complete approval over the design of the CSP Museum and Educational Center. The Vice-Chairperson, and the Second Vice-Chairperson, shall preside over organizational meetings that the Chairperson, and/or the CSPAAA President, cannot attend. The Vice-Chairperson, and Second Vice-President, shall complete all assignments given them by the Chairperson. The Secretary shall be responsible for the taking of minutes at all meetings and for other secretarial duties and obligations so assigned by the Chairperson, the President of the CSPAAA, the Officers, and the members of this organization. The Treasurer shall be responsible for the accounting of all funds raised by this organization and for the accounting of all funds maintained by this organization in financial institutions. The Treasurer shall have direct responsibility for all financial matters within this organization and shall be held responsible by the Chairperson for the maintenance of all finances and financial records. The Treasurer shall give a Treasurer’s Report at each meeting of this organization and, at a minimum, at the Spring and Fall Social Meetings of the CSPAAA. The Treasurer, and one other person appointed by the Chairperson, from the organization’s Officers and/or Board of Directors, shall consolidate, and verify, the financial status of this organization, each and every year during the month of October. The order of business conducted at all meetings shall be determined by the Chairperson. In the event of the dissolution of this corporation/organization, all assets, after all bills have been paid, will accrue to the Treasurer of the CSPAAA, to be used exclusively for the benefit of the Connecticut State Police Academy Alumni Educational Foundation. It is herein provided that no profits, fees, or other means of renumeration will be extended to any Chairperson, President, Officer, or member of the Board of Directors, of this organization. The By-Laws of this organization may be amended by a two-thirds vote of the members present at any meeting of the CSPAAA. Adopted on April 13, 2004, at the CSPAAA April Meeting, held in Southington, CT. I hereby certify that the foregoing By-Laws are true and correct as presented to the CSPAAA membership in both March and April, 2004. That these By-Laws were accepted, and approved, by a majority vote of the CSPAAA members present at the CSPAAA April 2004 Meeting.